Is the Barbell Z-Press Right for You? 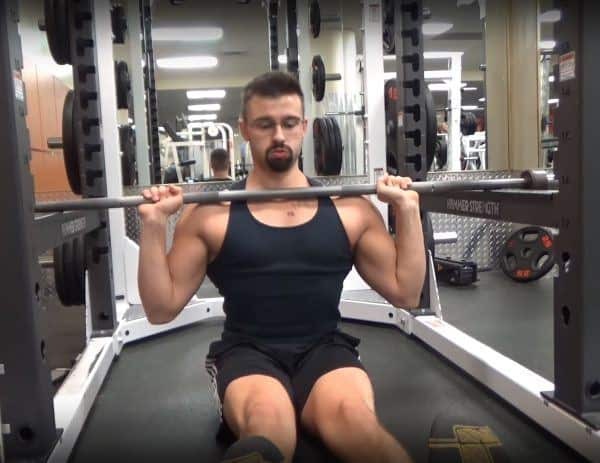 While seated on the floor and inside inside of a power rack, extend both legs flat on the ground and straight out in front of you, set up the safety arms of the rack in order to set a barbell somewhere between the top of the clavicles and level with your eyes. Wedge your body under the bar with an actively braced and rigid posture. Make sure your head and neck are held in a retracted position in order for the bar to clear. Tuck the elbows and flare the lats to build a “shelf” to push off of. Hands should be in the same position you use for a military press and a thumb over or a thumbless grip can be used. Here is the side view of the starting position. Note the elbows are directly under the wrists. Drive through the palms of the hands, pushing the bar in a straight line overhead. 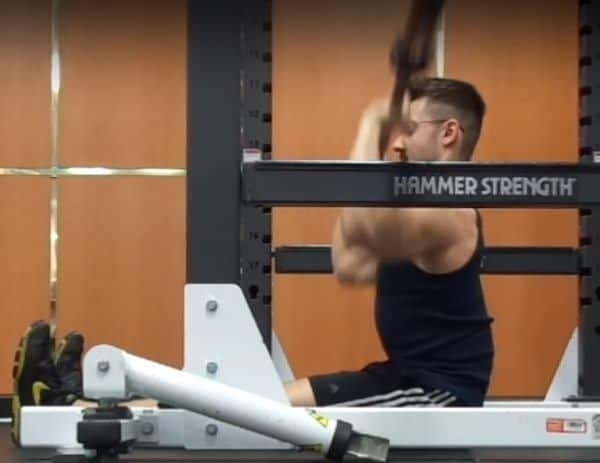 Once the bar clears the head, in one fluid motion, aggressively protract the head forward while flaring the elbows outward and over the shoulders. 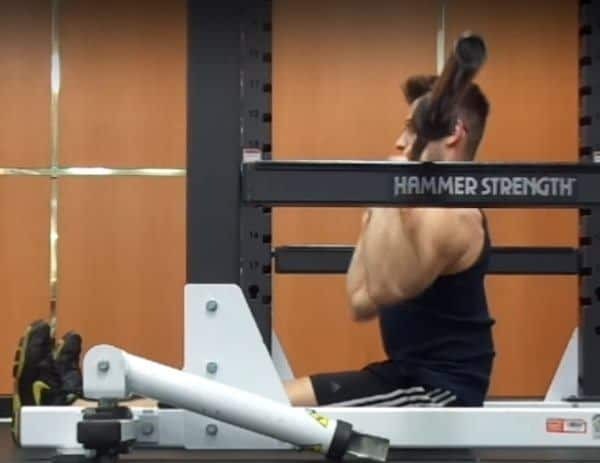 While the elbows are extending, retract the shoulder blades and squeeze the bar tightly. Just after initiating the concentric -- Note the elbows are relatively "tucked" in. Side view of the Z-Press right after starting the concentric phase. After the bar passes the head, you can begin to flare the elbows out as shown. Flaring elbows after bar rises past head, shown from the side. Note that the head is also starting to come forward. Full lockout shown from the front view. Elbows are locked and facing outward. Head is protracted forward to allow for this shoulder position. Side view of the lockout. 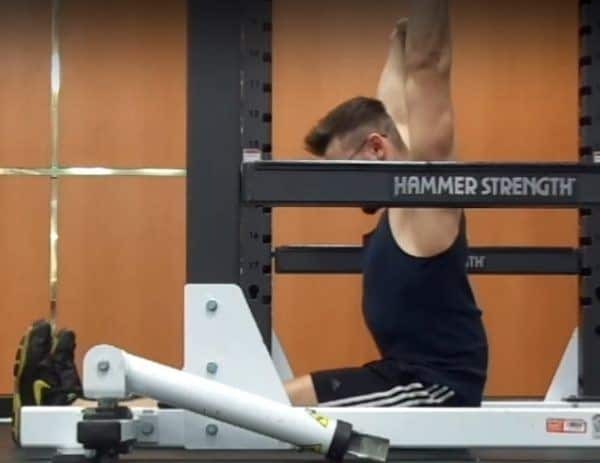 This shot really shows the proper head and shoulder position at the top of the rep.
Once the elbows are completely extended, allow time for the bar to settle and be motionless before moving on to the next phase of the lift. Initiate the downward movement with a slight elbow tuck while simultaneously driving the head back out of the path of the bar. Return the bar to the start and let it settle before the next rep. DON'T BOUNCE IT OFF THE SAFETIES! 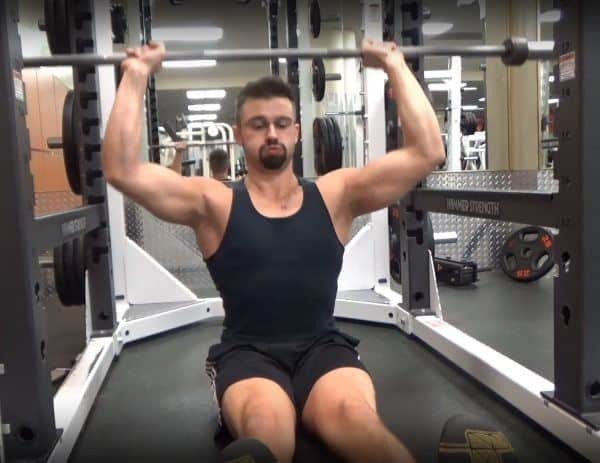 As you begin lowering the weight, your elbows should still be flared before getting to you head as shown. Initial portion of the eccentric phase shown from the side. Elbows tucked and head retracted as bar is lowered down in front of the face. This side view highlights how the head must be fully retracted to allow the bar to pass safely in front of the face. As shown, you are back at the starting point upon completion of the eccentric phase of the rep. Note the bar is set down and allowed to come to a halt on the spotters. Ending (and starting) position shown from the side. Note how the head has come forward somewhat after the bar has passed the face. Repeat each rep from a “dead stop” on the safeties. Return the bar to the safeties and be sure the bar as completely settled before moving on to the next rep. Actively brace the core by forcing the hips into a posterior pelvic tilt. This will ensure the shoulder and its mobility is doing the brunt of the work. It will also limit unnecessary extension. Be sure to flare the elbows hard once the bar passes the head. Also protract the head forward at this point to keep the bar over the shoulder capsules. 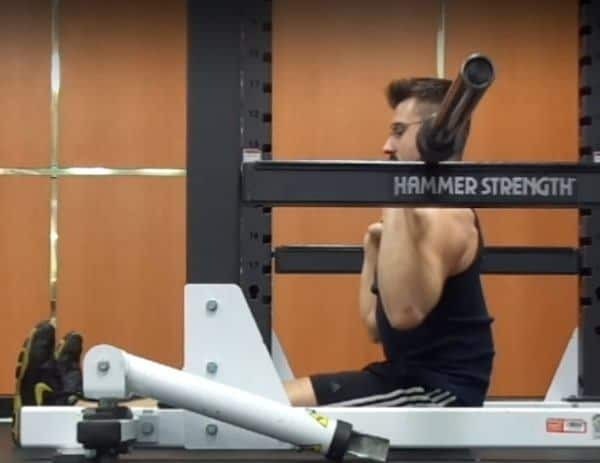 At the lock out, try to imagine “pulling the bar in half.” This will set the shoulder further back and down in the capsule and create a more stable lockout. Think SPEED. The bar is starting from a dead stop. You must generate as much force as you can in as short a time as possible. Actively squeeze the bar as tight as you can throughout the lift and imagine trying to “pull the bar in half” at the lockout. Keep the core actively braced and tilt the hips under your torso the keep trunk hyperextension to a minimum. Don't forget to flare the elbows and protract the head once the bar clears your body on the concentric phase. Similarly, tuck the elbows and retract the head during the eccentric phase. The Barbell Z Press is a brutally humbling exercise. Even very strong, experienced pressers will struggle. Make sure you have excellent core stability, shoulder mobility, and hamstring flexibility before attempting this lift.